Class A: This is suitable for cloth, wood, rubber, paper, various plastics and regular combustible fires. The extinguishing agent is water or foam. Class B: This is suitable gasoline, grease, and oil fires. The extinguishing agent is a dry chemical or carbon dioxide. Extinguishers smaller that 6 pounds (2.72 kg) are not recommended. Class C: This is suitable for energized electrical fires. The extinguishing agent is a dry chemical or carbon dioxide. Class D: This is suitable for combustible metals. The extinguishing agent is a dry powdered chemical. Class K: This is suitable for Kitchen fires, including oil, grease, and fat. The extinguishing agent is a wet or dry chemical. There several types of fire extinguishers that combined several classes together. Class ABC: This is an all purpose fire extinguisher that works on class A, B, and C fires. The extinguishing agent is a dry chemical. Class BC: This is another type of all purpose fire extinguisher that works on class B and C fires. The extinguishing agent is a dry chemical. Fire Extinguishers come in a wide variety of types; each one designed to put out a different kind of fire. Classification systems have been developed to help users know what sort of extinguisher they're working with. It is important to use the proper fire extinguisher for the fire you want to put out. Using a fire extinguisher isn't rocket science by any means, but there a few basics you need to be aware of and probably aren't. According to FEMA, the majority of Americans don't know how to use an extinguisher, even if they have one in their home. This is a dangerous knowledge gap. Fire doubles in size every 60 seconds, so you don't want to be fumbling around in an emergency situation, reading over the instruction manual as a small flame on the stove grows into an inferno. You need to know which extinguisher to choose and where to mount or put it. In choosing a fire extinguisher remember the different class types and choose one to fit the area you will have it placed. A home generally has a ABC type where a automobile repair shop may have an ABC, BC or B type. Commercial kitchens will have a K type. When purchasing an extinguisher read the information on the outside of the box containing the extinguisher for type of fires it can be used for. Get the biggest one you can comfortably handle to maximize it discharge pressure, time and range. Some states require you to have fire extinguishers in your home, but even if yours doesn't, they're an essential safety item, your second line of fire defense after smoke detectors. A fire extinguisher can keep a small incident from turning into a dangerous emergency. You should, at minimum, have one ABC extinguisher per level of your house. It's best to have one near each of the rooms where fires are most likely to break out, the garage and especially the kitchen. Store extinguishers where your kids can't get to them, but they're still easy to access, you don't want to be looking around and digging through a closet when every second is crucial. Don't place them near stoves and heating appliances, or behind curtains and drapes, places where fires may start and quickly spread; if you can't reach the extinguisher because the thing that's on fire is right by it, you're in trouble. The best location for your fire extinguisher is mounted near a door, your escape routes. Once you've gotten an extinguisher or two to protect your home, try to check it periodically to see if its pressure is still in the green zone, the seals haven't been broken, the hoses are intact, and it hasn't been damaged by things like dents, leaks or rust. You should be familiar if you read the information on the different classes of extinguishers and where to put them. Now how do you know if you can safely put out the fire with the fire extinguisher you have on the fire you encountered. Fire extinguishers are designed to put out fires in the incipient state. This is fireman talk for when the fire is just getting started. When it gets past the beginning stage, a fire becomes too large to fight with a portable extinguisher. One way to judge this is, "is the fire taller then you"; if it is then get out and then call 911. Your fire extinguisher will likely be no match for the flames. 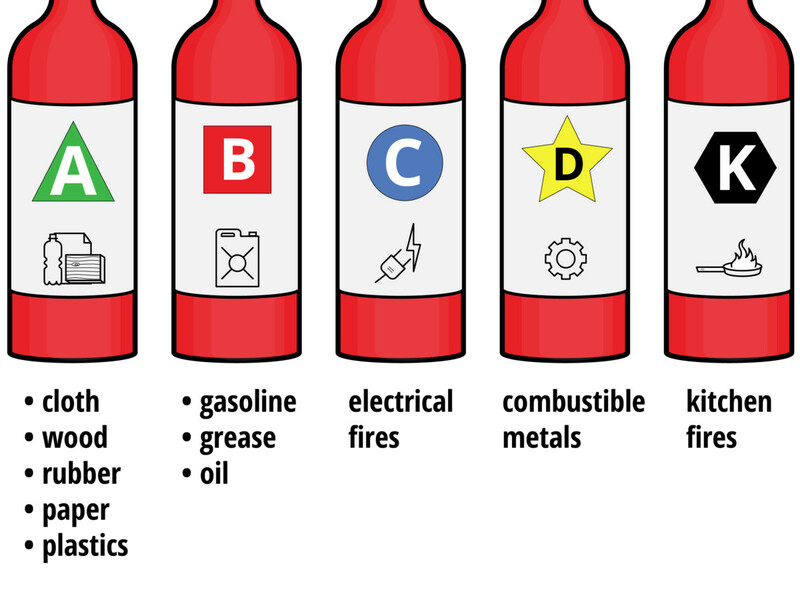 And remember to have the right type of extinguisher for the fire; this is why the best extinguisher to have is a ABC which is a general type for most fires. If you do have the right type of fire extinguisher and the fire is not taller then you and it is in the incipient state then you are ready to put out the fire with your fire extinguisher. First: Try to position yourself with your back to an unobstructed exit so that you can get out quickly if you need to. The discharge range for extinguishers can run from 6 to 20 feet(know your extinguisher's range beforehand), and you want to be far enough away to not be in danger of being burned, and close enough that the discharge will be effective. 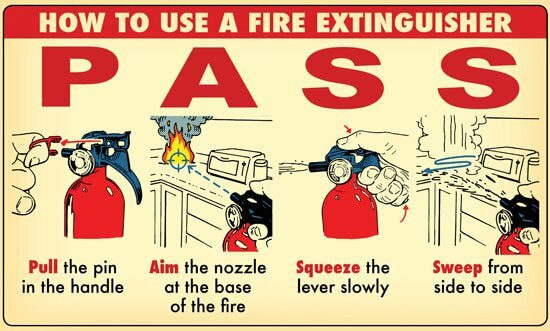 Second: To use the extinguisher with proper technique, just remember the acronym "PASS"
Aim the nozzle at the base of the fire. Hitting the tops of the flame with the extinguisher won't be effective. You got to smother the fire at its base. Squeeze the lever slowly. In a controlled manner, squeeze the lever to release the agent. Sweep from side to side. Sweep the nozzle from side to side until the fire is put out. Keep aiming at the base while you do so. Most extinguishers will give you about 10 to 20 seconds of discharge time. Third: Slowly back away. Even if the fire appears to be extinguished, don't turn your back on it. There might be unseen hot spots or hidden fires that can ignite into a large flame at any moment. You want to be on guard for that. Once you've used a fire extinguisher, even if you didn't deplete all the pressure, you must get it recharged. Do this soon as possible. If it's a disposable extinguisher, throw it away and get a new one to replace it. Remember the different classes of fire extinguishers and what would be best for your home, garage or basement. If you have any questions stop by the Fire Company in your area and ask for help, they will be more then happy to help you and even give instructions on proper use and answer any questions you may have.